In ancient classical and biblical farewell addresses, certain themes appear consistently. William S. Kurz has identified twenty elements commonly found in the final farewell addresses of famous men shortly before their deaths. Moses' farewell speech contains sixteen of these elements, while the farewell speeches of the apostle Paul and Socrates include fourteen and eleven elements, respectively. 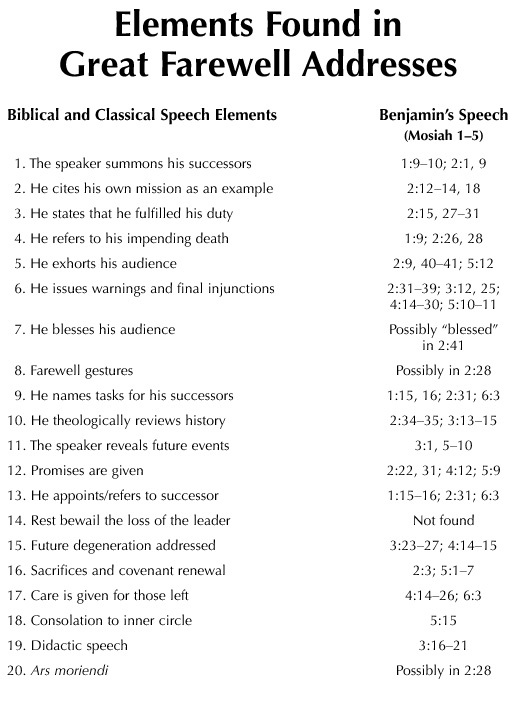 Sixteen, and possibly nineteen, of these elements can be found in the carefully preserved text of Benjamin's farewell address, making it perhaps the best example of this speech genre on record. This chart lists Kurz's twenty elements and shows where the elements can be found in Benjamin's farewell speech.